So the Diane von Furstenberg show rolled into town last week. One runway show, one Business Chicks lunch and one Hayman Island penthouse launch down, where is von Furstenberg now? Cooling her heels, she told me backstage on Wednesday night, at a mate’s Kangaroo Valley farm in the NSW Southern Highlands. A pretty spot, we assured her (here’s a Highlands wrap we did a couple of years ago). “I have my book to finish you know” she noted, arousing our curiosity as to precisely how long she is planning to hang around. With Hurricane ‘Frankenstorm’ Sandy currently bearing down on the US east coast and thousands of flights cancelled, perhaps a little longer than originally planned. Last week's show in the Sky Lobby of the new Westfield Sydney development was a chic do. Great spot for a runway show although the next one might want to accord a little more room for the backstage area, which was a pretty tight squeeze. The changing area was the lineup area (hence the lack of full-length outfit shots in the gallery, below). Wearing a neon pink paillette-embellished white T-shirt dress from her Resort 2013 collection, von Furstenberg held court checking on all the models as they lined up in first looks – a mix of well-known and not-so-well-known local names such as Jessica Gomes, who opened and closed, Alice Burdeu, Lauren Brown, Christina Carey, Eliza Humble, Rachel Rutt, Annika Kaban, Katerina Chang and Paris Fontana. “Very pretty” said the designer, as she checked the lineup and then posed for a series of impromptu shots with models and members of the production team, with some rushing to upload their shots to Facebook before the show got underway. “I’m star struck!” said Humble as she uploaded hers in mid lineup. Von Furstenberg’s boho de luxe Spring/Summer 2013 ‘Palazzo’ collection, first shown last month at New York Fashion Week, featured more on-trend colour-blocking than the prints for which she is so well known – and certainly none of her signature 'wrap' dresses, which were nevertheless very much in attendance in the audience. A number of showgoers, including Australian television reporters Angela Bishop and Laura Sparkes, had raided their closets for the occasion to do their own personal DVF homages. Palazzo was the last collaboration with Yvan Mispelaere, von Furstenberg’s creative director for the past two years, following a near decade working with Nathan Jenden. A number of creative/design directors have come and gone since she first launched her brand in 1972 and then re-launched it in 1997, following several years hiatus. From Michael Smith (1980) to Catherine Malandrino (1998) and Samantha Treacy (1999). According to von Furstenberg’s vice president of global communications, Grace Cha, Mispelaere won’t be replaced. There’s a substantial in-house design team already in place. And besides, until such a time as von Furstenberg decides to retire, we must say, it’s a little confusing when she takes her bow at New York Fashion Week with another designer in tow. Jenden in particular had a peculiar habit of walking behind her clapping over the top of her head as they did the post-show victory lap. All up I barely had five minutes chatting to DVF, squeezing in a few questions backstage before and during the show. 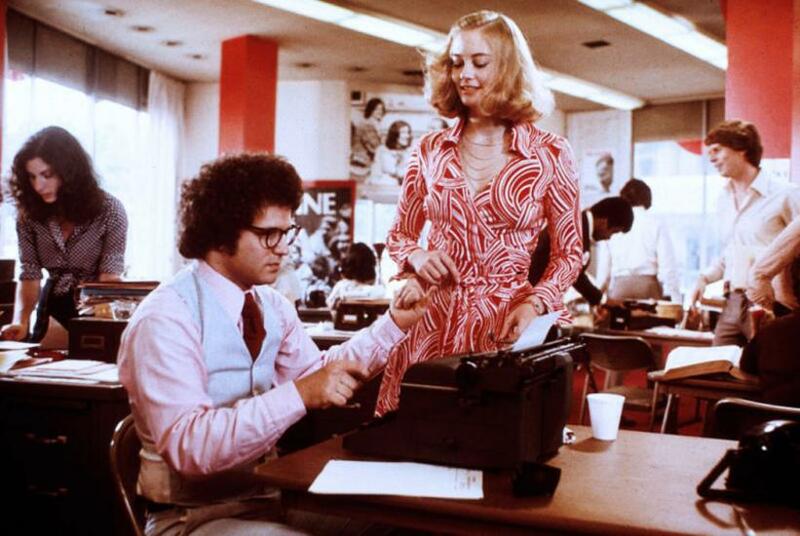 Of note, she told me that her print archive in New York holds 10,000 prints; that she has not yet reissued the print in the infamous red and white wrap dress worn by Cybill Shepherd in Martin Scorsese’s 1976 classic Taxi Driver (below), “But it’s not a bad idea – I think I might”; and that after posing for so many photos “Sometimes you feel like you have no soul left”. I also asked if anyone in her personal entourage calls her “DVF”. The answer: “Yes a few people... including my son and my husband”. Of the key differences between the fashion business now and when she started out in the 1970s, von Furstenberg noted that although it's a lot bigger, not to mention global, these days, fashion is still nevertheless “always the crazy business... you don’t really understand why and how”. I was also interested to hear her take on the position of women in the workforce today compared to the early 1970s, when she not only entered the fashion industry but her wrap dress became inextricably linked with the women’s liberation movement. With no zips and no buttons – which von Furstenberg has remarked on many occasions made the garment so terribly convenient for a quick getaway following a one night stand - the body-hugging garment in luxurious silk jersey and a myriad of eye-catching, Scandinavian-look prints was like a new working uniform for women; a smart hybrid of the era’s male body shirt and a dress. It continues to be a very popular choice for, among many other professionals, tv newsreaders and reporters. “It’s a complete outfit” Ten's entertainment reporter Angela Bishop said backstage before the show. “The situation with women is very strange, it’s like a pendulum - in some cases we go ahead and in some cases we go backwards” noted von Furstenberg. Via her philanthropic work with the Diller-Von Furstenberg Family Foundation, which has donated over USD60million since its 1999 launch, the multi-millionaire and her billionaire husband Barry Diller are better-acquainted with organisations such as Human Rights Watch, the International Womens Media Foundation and Cambodian author and human rights advocate Somaly Mam – all DVFF grantees - than you might imagine. “Being young in the Seventies, we really thought that we had ‘won’ it and we had invented freedom” she added. “Who would have known that 40 years later we would be like this? The world is so different and in so many ways it’s not going better for women”.